I hope you've been visiting some the blogs before me in this hop! 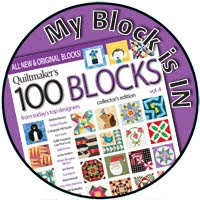 Each of us has created something using one of the many blocks that Teresa designed for this book. You can go back to this post for the list of bloggers to check them out. 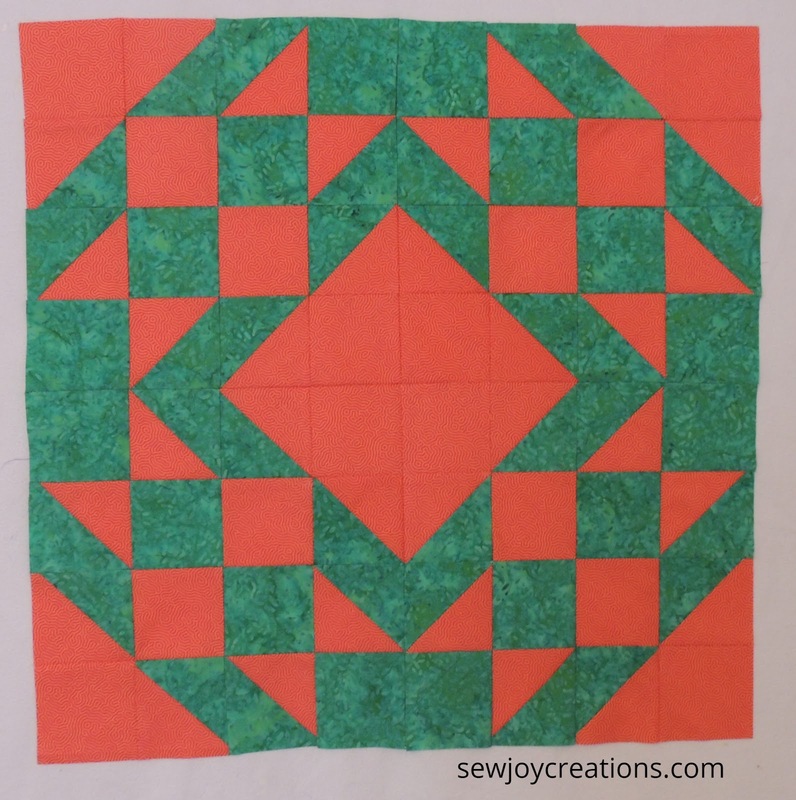 For my turn I am using the half square triangles and squares block in a variation called Diamond Star. I decided to go bold and play with some bright coral, Pantone's color of the year, and a Ketan batik green. Here are my four blocks arranged in the Star Diamond. Pretty bold, eh! These blocks repeated would make a really nice quilt. 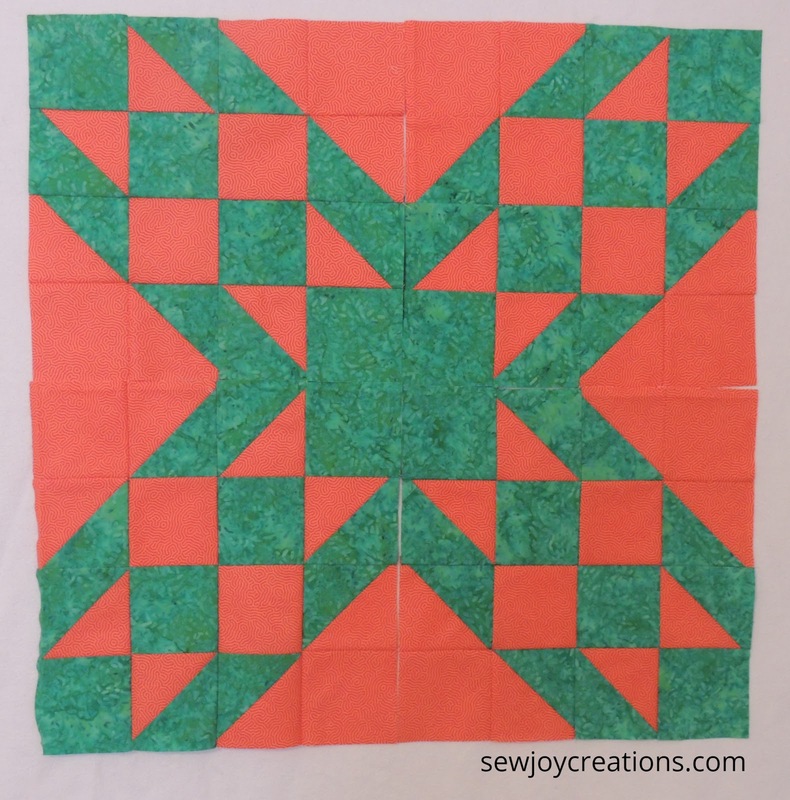 But, I didn't have time to make a whole quilt! I decided to set my blocks differently. I took my four blocks and arranged them with the orange touching instead of the green and turned them into a pillow cushion. Here are the blocks before being quilted. You can see that in this orientation the design looks quite different. 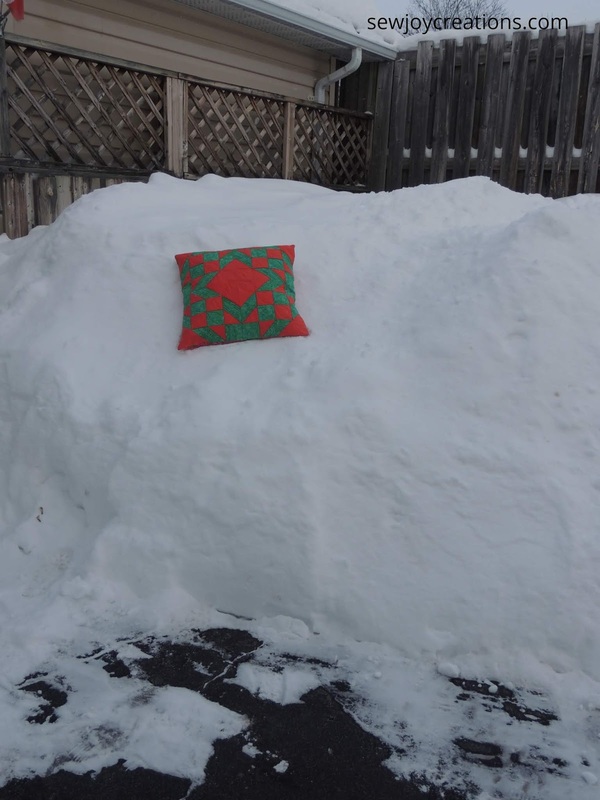 I'm not sure I'd like a whole quilt in this arrangement, but it's perfect for a cushion! 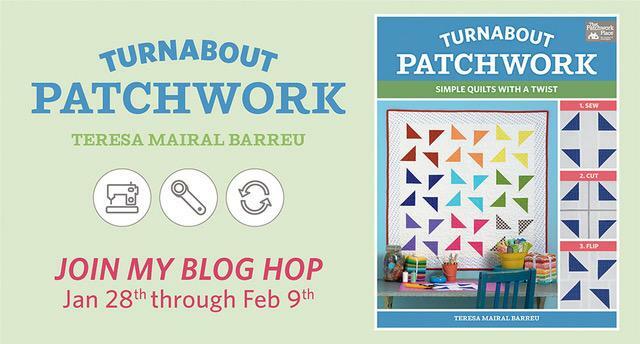 Martingale, the publisher of Teresa's book, is generously offering electronic copies of Turnabout Patchwork. Please leave a comment here on my blog about what you like best about blog hops! I'll draw a winner at the end of the hop on February 9th. I love seeing the variations of color and fabrics with the patterns. I love seeing the original projects and then how different bloggers put their own spin on what the designer envisioned. 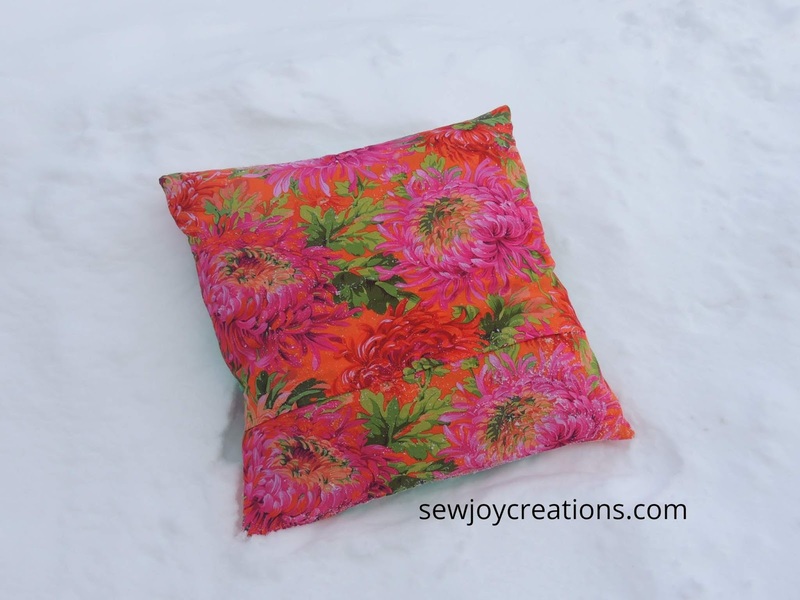 Love your bright and happy cushion! After too many days of COLD, COLD and more cold, it's great to see cheerful colours! 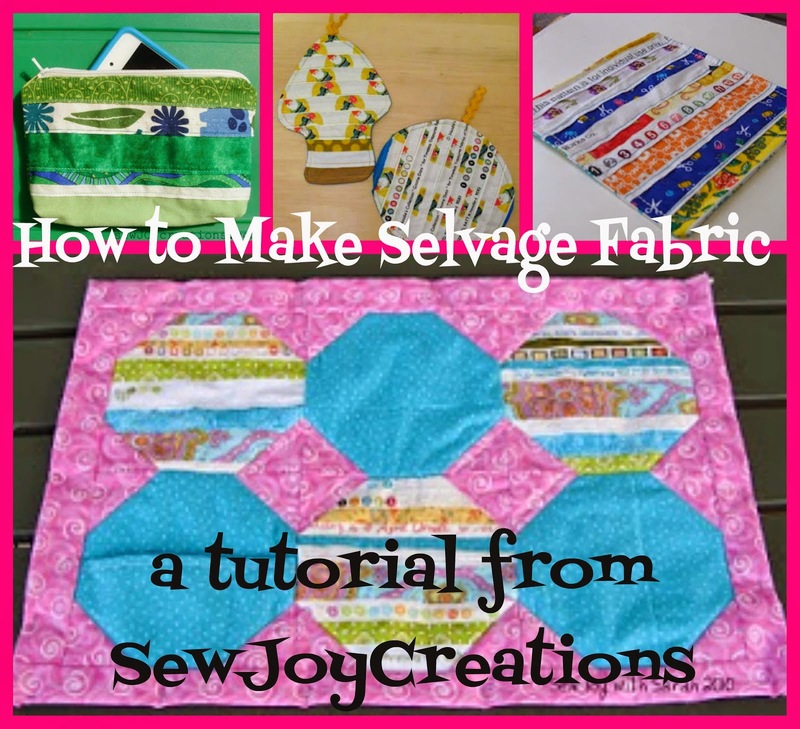 I love learning about new books and fabrics and seeing projects using different approaches. Always inspiration! Thank you for sharing. 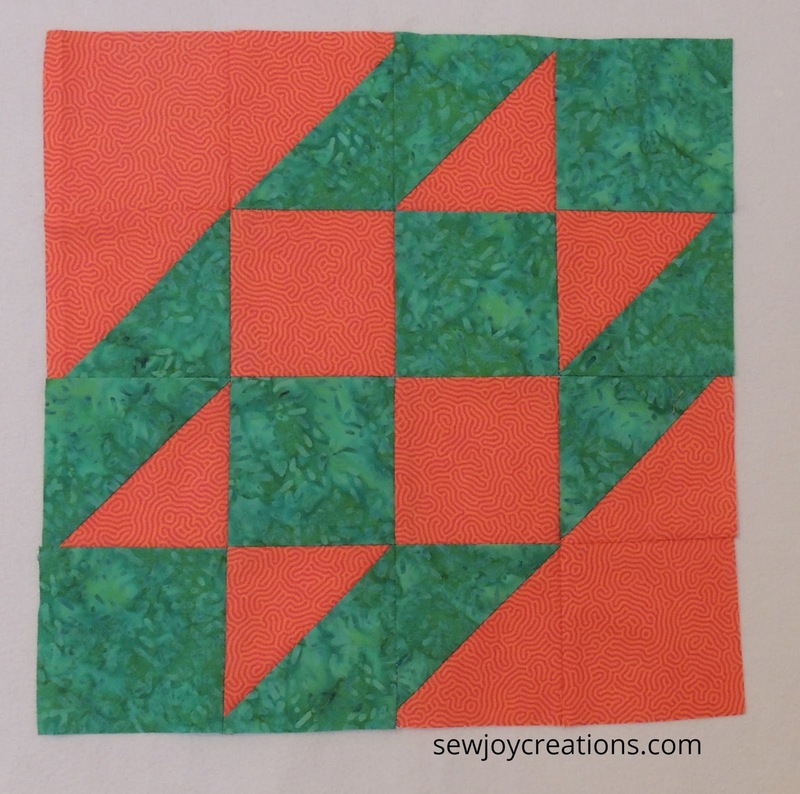 I love seeing the same quilt or block in different fabrics. The hop also lets me see what kind of projects are in a book. 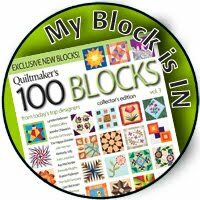 I love this block! and your snow bank is huge!! It's always interesting to see the same design made up in different fabrics. 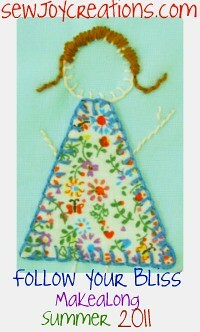 I love seeing the projects made in different fabrics and colors. I also enjoy the blogger's personal comments on any adjustments or changes that they made to the pattern. 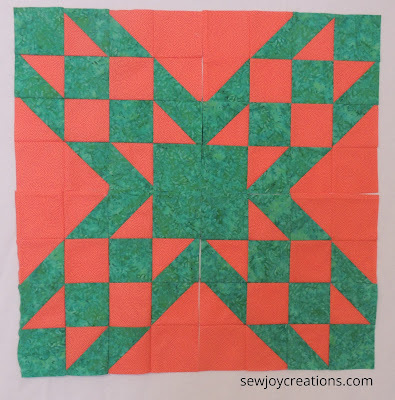 The two layouts you used with sashing used on the same quilt would be really interesting! Blog hops are great for inspiration. So many different looks from one pattern. Great to see what the different settings look like! I love making pillow covers from quilt blocks. Great job! You find new blogs to read! 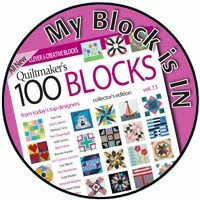 Blog hops give me an opportunity to see the creativeness of quilters I never knew about before as well as giving me new blogs to follow! 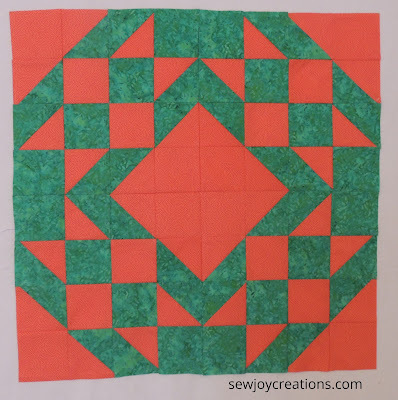 Blog hops let me see what's new in the quilting world and I love to see fabric color combinations! I love the inspiration from blog hops, seeing fabric combinations I might not have considered, seeing quilting options I might not have known about and of course learning new techniques. This is the first time that I've followed a blog hop more than one day. I've enjoyed seeing all the blocks. It gives me more ideas on how different fabric choices would look. Those are some vibrant colors for your pillow. 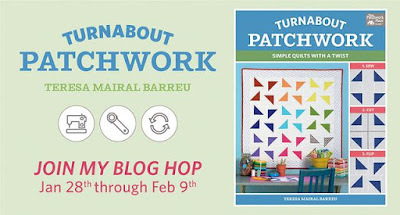 I like seeing all the different ideas for projects on a blog hop. Sometimes its hard to picture a project I would like to make from a single color or size that is presented by the original maker. Seeing someone else's interpretation or color way really helps to influence my liking the project better. Thanks for sharing!! 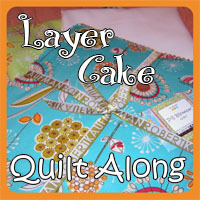 I enjoy seeing other quilter's ideas. Using different fabric, values, and colors, the pattern changes. So fun to see the different projects. Great way to turn those blocks and make a statement. 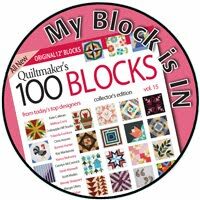 The thing I like be most about blog Hops is meeting new to me quilters and seeing where their quilting journey is taking them. The resulting inspiration from enjoying the eye candy is crazy fun. I love the design. My grandson would love all that orange. Just what we need in the middle of winter--a bold statement! Blog hops are great way to get inspiration. Sometimes this is a design or design element, sometimes it is color combos or prints vs solids, and sometimes they provide the motivation to try something new. I love to see how many looks you can get by the different fabrics the different bloggers use. Always inspirational. Thanks. I really like seeing how different quilters interpret the same patterns, or use the same fabric to make very different quilts. 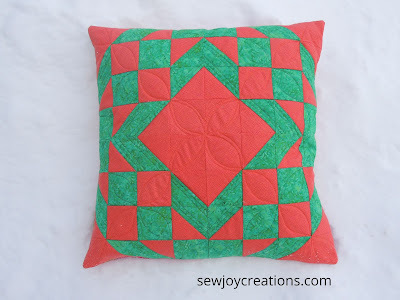 I like how the block turned out and think it would make a great pillow. 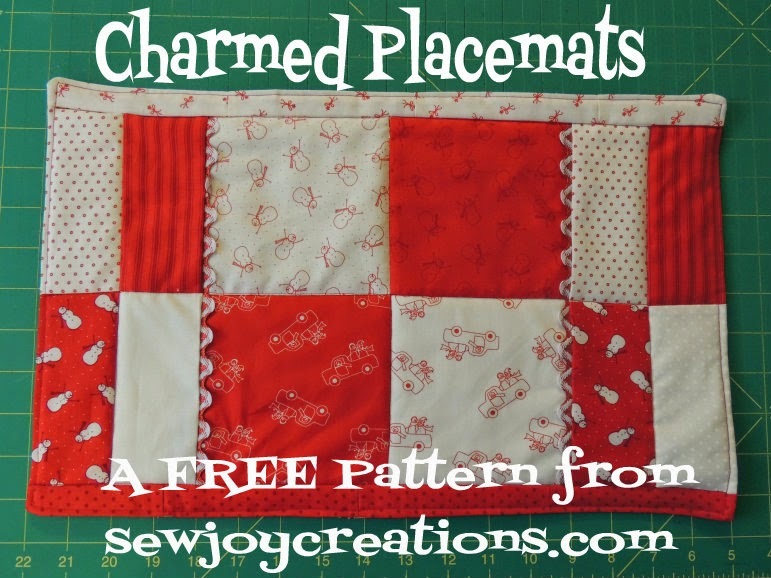 This reminds me so much of an Amish style quilt pattern. I love it! Love your layouts! And so easy to achieve. Thanks for the chance to win. 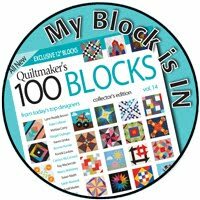 My favorite thing about blog hops is getting introduced to new-to-me quilters as well as picking up tips that I haven't previously tried. I love all of the inspiration provided with blog hops and seing all the creativity out there. I love seeing lots of different blogs that I haven't come across before. 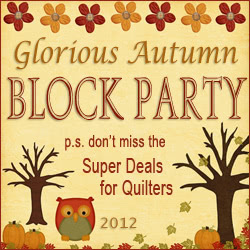 This seems particulary true of this Blog Hop. I've 'met' a whole host of designers and makers for the first time - including you!